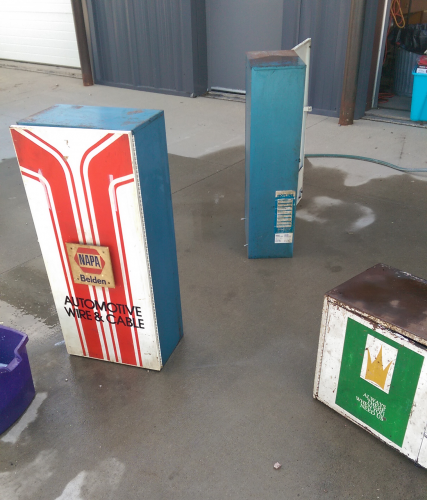 If you like automobilia, if you’re looking for some cool vintage advertising for your man cave, take a look at these vintage metal auto part storage boxes. Original metal wall-mounted tool cabinets which once hung in Sahr’s gas and service station in downtown Fargo, North Dakota, these were pretty stinkin’ dirty. This is them after being sprayed with the hose, before any scrubbing took place. But we cleaned them up and now they are spiffy enough to use in your home. Even better than metal advertising signs, these vintage metal cases hold things! 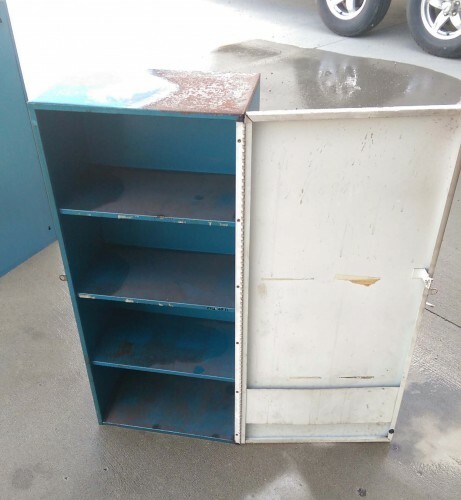 They can be used, as they once were, as tool and supply cabinets to hold auto, fleet, farm, and marine parts; or you can store anything you’d like inside as there are shelves as seen in the photo above — but don’t worry, all clean now! 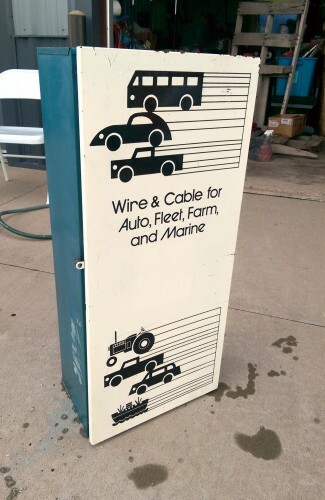 I think the black and white box with the retro 70s car, boat, tractor, truck, bus, and boat graphics would be a cool way to store Matchbox and other collectible cars — for little and big boys. But once you buy it, fill it with what you like! 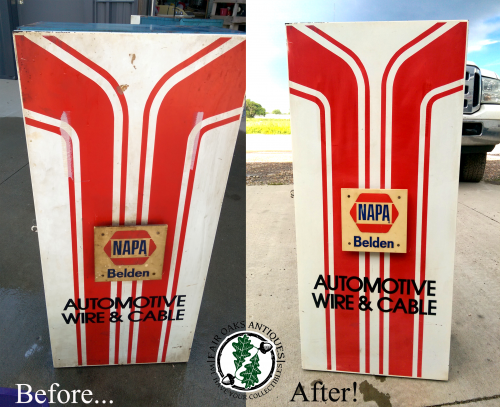 Uncommon pieces as they were only available to service stations, auto supply shops, and the like; not for consumers. 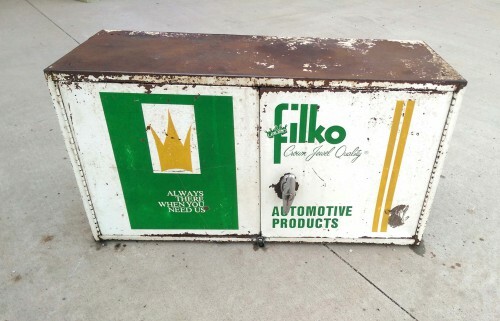 The taller upright metal Napa & Belden cases are likely from the late 1960s-1970s; the shorter, wider, unit with the green and gold Filko advertising is circa late 1940s-1950s. You’ll find these items, and many others, in our booth at the Elkhorn Antique Flea Market this weekend in Wisconsin. Our booth is located outside, near the entrance to the flea, in booth #214. Call 701.306.6145 if you need help finding us! PS We travel to the flea tomorrow, so keep an eye on our Facebook Page for updates with photos!